It's that time of year again, when us whale folks start anxiously anticipating the arrival of the Southern Residents in inland waters. Sure, it's light past 8 PM again, the swallows are patrolling the island's fields, and I can take a walk without a jacket, but it won't feel like the season has really started until hearing these three words: "Many whales inbound". This year, like last year, we're waiting longer than we used to. The days slipped off the calendar from April into May, and other than a surprise brief visit from K-Pod, there's no sign of the Southern Residents in the Salish Sea. I recently participated in two workshops about orcas and salmon: The Whale Museum's naturalist gear-up here on San Juan Island and a joint effort by several regional organizations of an orca and salmon recovery workshop in Seattle. Finally, thankfully, it seems like some discussion about the real issues facing these whales is starting to happen. There was a lot of public attention given to potential vessel impacts on the whales as NOAA went through the process of instituting new regulations for boating around the whales. General consensus is that the real issue facing these whales is not boats, not toxins, but salmon. No fish, no blackfish. It's that simple. There are a couple of major conclusions I made as a result of attending and participating in the recent two orca-salmon workshops. One is that, amazingly, people just don't seem to talk to each other. The lack of communication - between salmon and whale biologists, between the US and Canada, etc. - is astounding. One would think - or at least hope - that the people doing salmon recovery and the people doing whale recovery would be working closely together. The truth is, they may not even know each other. A major comment from the salmon folks at the Seattle workshop was surprise at all the new faces in attendance. They've just never talked to the whale people before. As Jim Lichatowich, an author and retired salmon biologist, shared with us at the Friday Harbor workshop, it's worse even than that: the hatchery fish people and the wild fish people don't even communicate. It really seems like everyone is focused on their own slice of the pie and there's not much collaboration to look at the bigger picture. A second truth that I was shocked to learn is that hatcheries are still seen by many as a major solution to our salmon problem. There's a wealth of evidence to the contrary, which I won't go into detail here, but I highly recommend Jim's book Salmon, People, Place as a good read to learn more about this and other relevant salmon issues. It really hit home when a WDFW biologist at the workshop in Seattle said, "That the jury is still out on whether or not fish farms [in Canada] have any effect on wild salmon populations." For those of you that don't gasp in outrage at this statement, I highly suggest you watch the documentary Salmon Confidential (viewable in its entirety at this link) and/or tune in to a special episode of 60 Minutes focusing on salmon farms that's airing this Sunday on CBS at 7 PM PST. The final realization I made at the workshops is that those of us who have been around the whales for many years have many impressions of what has been changing in their behavior. The trends we've witnessed are universal across observers, but for the most part they're very anecdotal: the whales aren't here as much in the spring, there aren't as many superpods anymore, and so on. I think us naturalists are correct in our observations, the problem is, it's hard to demonstrate the truth behind these impressions without some sort of quantitative data. After giving it a lot of thought, I decided I wanted to try and put some numbers to some of these impressions. I've done some data mining in the last couple weeks, and I have the results to share with you here. My friend and mentor Rich Osborne has always stressed to me the importance of long term data sets, and never have I agreed with that more than now. You may not realize what impact that data your collecting will have in the long term, but often the questions will come after the answers. If you have the data set, the information you can parse out of it as questions arise later is pretty amazing. The data presented here come from three such long-term data sets. The first is Bob Otis' data from Lime Kiln Lighthouse. For more than 20 years, Bob and a team of interns have collected data on whale passbys from May 20 to August 10 between the hours of 9 and 5 in a defined study area in front of the lighthouse. This collection of data, including a lot of behavioral data, is an amazing slice of what the whales were doing in one particular place over time. 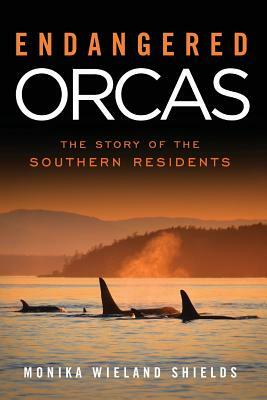 The second data set is The Whale Museum's Orca Master archive of whale sightings, in which they've compiled reports from many different sources into a single compendium of orca sightings in inland waters. Finally, I've also referenced the technical reports of the Pacific Salmon Commission, which date back to the 1970s. It's also worth mentioning that I know there are caveats, statistical and otherwise, to all the graphs I've made here, but I still wanted to share my first stab at quantifying these impressions of what we've seen the whales doing lately. 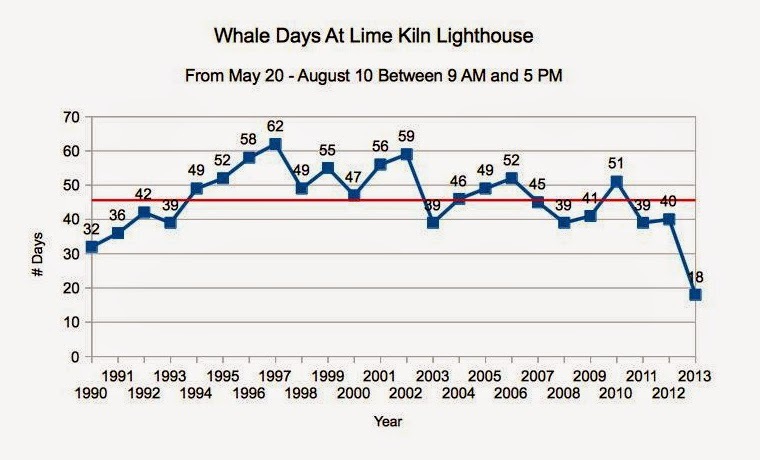 Number of "whale days" at Lime Kiln Lighthouse. A whale day is defined as whales being in Bob Otis' defined study area between the hours of 9 AM and 5 PM. Data were collected each year from May 20 - August 10. The red line indicates the average. Last year, with just 18 whale days, was less than half of the average. This summarizes the summer months nicely, but what about the spring? When I used to be just a seasonal resident on San Juan Island, I remember a friend of mine telling me I just had to find a way to get up here in April, because that's what she was having some of her best whale encounters of the year. "J-Pod is on the west side almost every day!" she exclaimed. By the time I did move here full time, things had changed. I've never seen the Residents much in April. This same trend has been expressed by many - that the whales used to be here routinely in the spring, but now are spending less and less time here in April and May. To try and quantify this, I looked at how many days in the month of April residents were seen in inland waters. Curious as to whether or not this has anything to do with fish, I also looked at spring runs of Chinook salmon on the Fraser River, and graphed these numbers on the same chart. The blue line indicates the number of days Southern Residents were seen in inland waters in the month of April, with data from The Whale Museum's Orca Master data set. 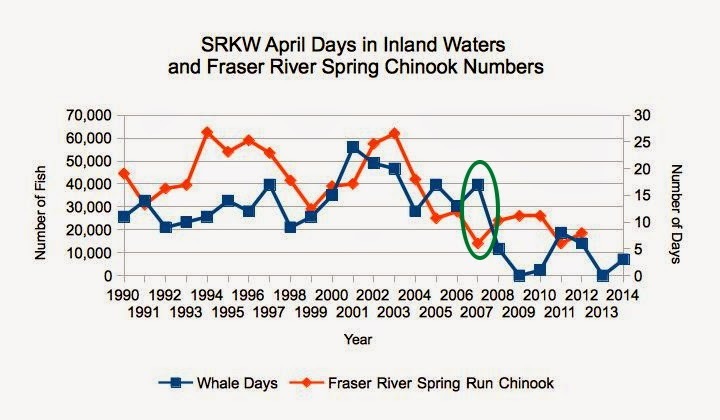 The red line indicates the total escapement (the number of fish that actually return to the freshwater spawning grounds) of Fraser River spring Chinook of both the age-1.3 and age-1.2 runs combined. These abundance of each of the two stocks was estimated off graphs in the Pacific Salmon Commission technical reports. Circled in green is where I think things changed - in 2007. The whales were here a lot, but salmon numbers were at their nadir. Perhaps this is when the whales decided it wasn't worth their time to visit the Salish Sea in April anymore - after that, their visits declined sharply, and spring salmon numbers remained depressed. Another common impression is that the whales have been more spread out than they used to be. Again, I turned to Bob's data to try and put some numbers to this. In Bob's study area is an imaginary line that extends out from the lighthouse across Haro Strait. A note is made whenever a whale crosses this imaginary line. The time that passes between the first whale and the last whale to cross is noted as the spread out time. If all the whales are in one group and cross the line together, the spread out time is zero. If J2 Granny is way up ahead of everyone else, and the rest of the pod slowly follows her north in their matrilines, the spread out time might be an hour or more. To correct for the number of whales present (because it makes sense the spread out time would be a higher for a superpod of 80 whales than when it's just the L12 sub-group present), I looked at spread out time divided by the number of whales present. I came up with an average spread out time per whale across all the passbys Bob and his interns collected data for in a year, and that average is what's graphed here. 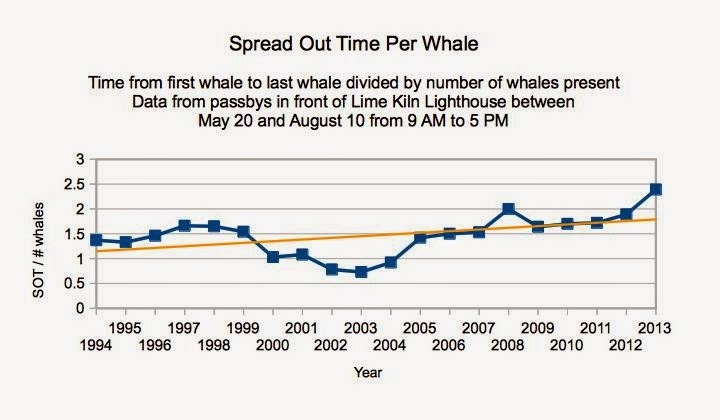 Average spread out time per whale for passbys in front of Lime Kiln Lighthouse during Bob's study period each year. A yellow trendline has been added to the graph, showing an upward trend in spread out time over the years. A change from an average of .5 to 2.0 might not seem like much, but think of it this way: In 2003 the whales were on average half a minute apart from each other. In 2012 this average was more like two minutes per whale. That means for a group of 10 whales to pass by, the average time it took changed from 5 minutes to 20 minutes, or a 4 fold increase. Finally, people have also been saying that the whales seem to spend more time foraging and less time socializing in the Salish Sea in recent summers. There seem to be fewer superpods, and when they do happen, they seem to be shorter in duration. This is a harder one to quantify, because even when people do define whale behavior into categories such as foraging, traveling, resting, or socializing, it's a subjective definition and also may not apply to all the whales present - e.g. most whales might be resting while one juvenile is breaching repeatedly in apparent play, or all the whales might be traveling steadily in one direction when one animal breaks off and mills in one location in apparent pursuit of prey. When I think of superpods or other groups of highly social whales, I think of lots of surface active behaviors: breaches, tail slaps, pec fin slaps, etc. All these behaviors are defined as surface percussive behaviors in Bob's study. I calculated an average number of percussive behaviors per whale for each passby in Bob's study, and then averaged this number across all the passbys in a season to get a single number for each year. 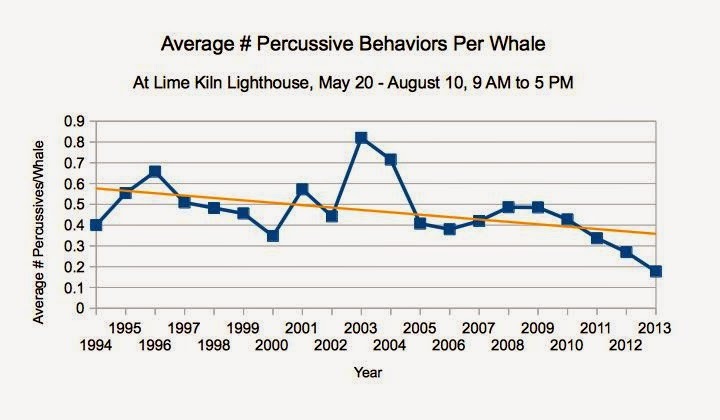 Average number of percussive behaviors per whale across all the passbys in a season. A yellow trendline has been added to the graph, indicating a slight downward trend in the number of surface percussive behaviors over the study period. According to this trendline, twenty years ago in an average passby of 20 whales you may have expected to see about 12 surface percussive behaviors. Last year, with a passby of 20 whales, on average you would have only expected to see 4 such behaviors. I'm excited that discussions about the changing behavior of our Southern Residents has been happening, and I hope I've been able to contribute further to those discussions here. What do you think, do these data support your own observations? What other trends have you noticed over the years in watching the Southern Residents? Literally as I was writing this I got word that some Residents were found near Active Pass. Here's hoping that this is the beginning of a summer season with a little more "whale time" than last year! Thank You Monika - this is great work. Once again you put a lot of work into this. It is very impressive and it is bound to be of assistance in future studies. Good job Monika! Thanks for words of support for long-term data collection. Sometimes it is hard to keep enthusiasm up for that. It also usually takes dedicated volunteers because paying people to do it would be very expensive. When people are paid to do a job, like work for an agency or do research, they are usually going to focus on a pretty narrow objective in order to get support and approval from "above." This "stove-pipe" syndrome you mention is pretty common and frustrating! Even collaborative efforts like Puget Sound Partnership have trouble overcoming that! Having more Non-profit groups with broad missions to encompass a variety of disciplines would help this I think. Funny that right after you posted this J pod showed for an overnight visit and then boogied on back to the ocean. They were widely spread out and didn't stay long, which continues the trend lines you so diligently document. Thanks for finding those trends in the data. I am so impressed with your presentation and big picture thinking. Thank you, will share this. Hoping thing will turn around. Thanks for the comments everyone. Jill - are you kayaking again this summer? I've shared how you didn't see whales on your west side trips last summer as an example of how things have changed! What's wrong with a dock?